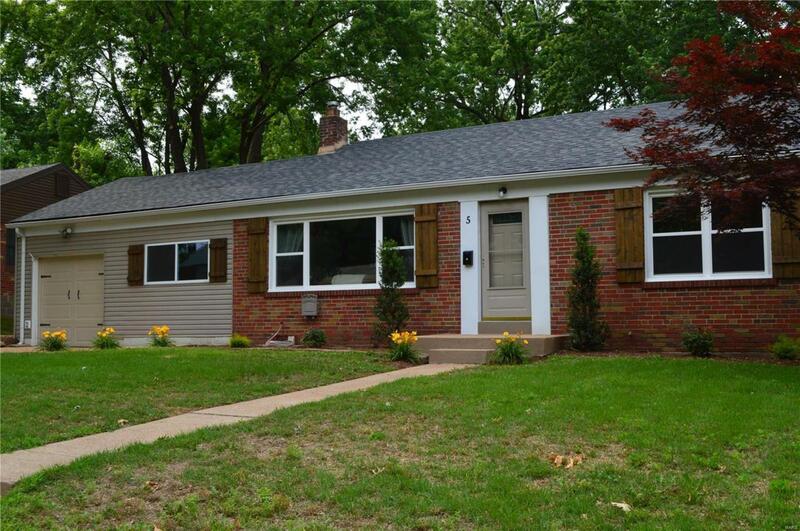 Charming and completely updated ranch near the heart of Florissant. Close to shopping, major highways, schools and more. This home has been completely updated from the roof to the basement. New architectural roof, new windows, new electrical, new plumbing, new carriage garage door with opener, new carpet, new stainless steel appliances including fridge, new cabinets and counters with gorgeous backsplash, new light fixtures throughout with ceiling fans in bedrooms, completely redone bathrooms with tiled shower and tub, mudroom with additional cabinets for more storage and locker area for all the kiddos stuff! Barn doors complete the look of this great home. Third room on main level can be used as a bedroom or office. Pristine finished lower level with great room rec area and built in's and full bathroom with shower. Nothing has been missed in this professional rehab done by one of St. Louis' premier builders. Don't miss this one before it is gone!